Amos Duggan is a visual artist based in Melbourne, Australia. He completed a Diploma of Visual Arts: Fine Arts in 2004 at the Sunshine Coast Institute of T.A.F.E. 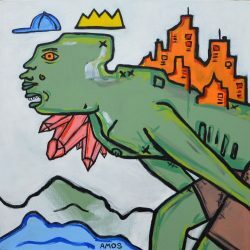 Since the completion of his Diploma, Amos has continued to regularly exhibit and showcase his new works through local and international arts festivals, galleries and publications. The subject matter and concept inspiration behind Amos’ paintings has always been subtly evolving and developing throughout his career. From the beginning there was a large emphasis on expressions of raw human emotions and personal inner workings. 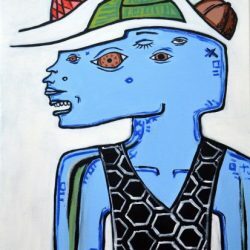 These themes featured heavily in the artist’s first solo exhibition titled ‘INNER GRAFFITI’ which showed at the Noosa Regional Art Gallery, QLD. As time moved on and life’s journeys aided the natural progression of his work, we saw the artist drawing inspiration from the futuristic values of scientific advancements in modifying and manipulating the physical form for both life-preserving and vanity-serving reasons. This moved through some absurd and ambitious visual depictions of what is already practiced today, and what may possibly be done in the not too distant future. 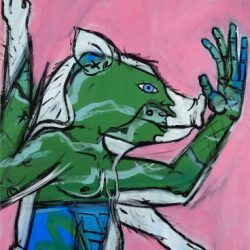 This was the era of the ‘FUTURE BEINGS NOW!’ which also saw the artist emerge from the Sunshine Coasts petri dish, and begin to exhibit further abroad in group and solo exhibitions’ throughout Brisbane, Melbourne and Sydney. 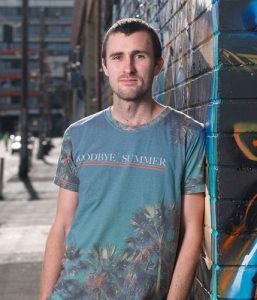 In late 2009 Amos became a permanent part of Australia’s artistic community in Melbourne and has continued to draw on all previous research and exploration to forge and refine an amalgamation of these two strong and interlocking themes to create his very own unique vision of humanity. This is seen throughout the artist’s more recent works where the notions of body modification are seamlessly interwoven with a juxtaposition of raw emotions and psychological conditions. 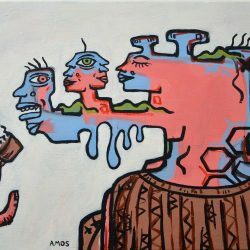 As the paint flows from Amos’ brush and onto the canvas, the subconscious takes over and his mind starts having its very own visual conversation. Colours pour out and blend into one another, while lines of varying thickness forge their way through the landscapes and form patterns and outlines of their very own unique Liquid Language. Born in 1984 in Kenilworth, Queensland, Australia. 2004 Diploma of Visual Arts: Fine Arts, Sunshine Coast Institute of T.A.F.E. Nov 2014 Untitled Show (group show) – Earthcore Festival, Pyalong, VIC.